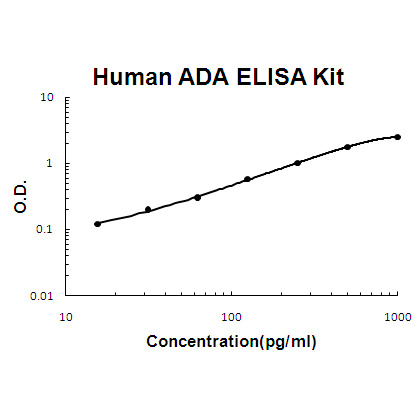 Intended UseHuman ADA ELISA Kit allows for the in vitro quantitative determination of ADA , concentrations in serum, Plasma , tissue homogenates and Cell culture supernates and Other biological fluids. specificalPrinciple of the assay: Human ADA ELISA Kit was based on standard sandwich enzyme-linked immune-sorbent assay technology. A monoclonal antibody from mouse specific for ADA has been precoated onto 96-well plates. Standards(Expression system for standard: sf21, Immunogen sequence: A2-L363) and test samples are added to the wells, a biotinylated detection polyclonal antibody from goat specific for ADA is added subsequently and then followed by washing with PBS or TBS buffer. Avidin-Biotin-Peroxidase Complex was added and unbound conjugates were washed away with PBS or TBS buffer. HRP substrate TMB was used to visualize HRP enzymatic reaction. TMB was catalyzed by HRP to produce a blue color product that changed into yellow after adding acidic stop solution. The density of yellow is proportional to the human ADA amount of sample captured in plate. Background: Adenosine Deaminase (also known as adenosine aminohydrolase, or ADA) is an enzyme involved in purine metabolism. It is needed for the breakdown of adenosine from food and for the turnover of nucleic acids in tissues. ADA in humans is involved in the development and maintenance of the immune system. However, ADA association has also been observed with epithelial cell differentiation, neurotransmission, and gestation maintenance. It has also been proposed that ADA, in addition to adenosine breakdown, stimulates release of excitatory amino acids and is necessary to the coupling of A1 adenosine receptors and heterotrimeric G proteins. Adenosine deaminase deficiency leads to pulmonary fibrosis, suggesting that chronic exposure to high levels of adenosine can exacerbate inflammation responses rather than suppressing them. It has also been recognized that adenosine deaminase protein and activity is upregulated in mouse hearts that overexpress HIF-1 alpha, which in part explains the attenuated levels of adenosine in HIF-1 alpha expressing hearts during ischemic stress. Inquiry About Human ADA ELISA Kit If you hope to order it or contact us directly, please contact us via sales@biobool.com. We will get back to you in 12hrs,Thanks!